On the eve of 3rd August 2012, Calcutta was fortunate to be treated with a recital from the dhrupad exponent Sri H Sayeeuddin Dagar, who is none other than the son and disciple of the illustrious “Tansen Pandey of Calcutta” – late Hussainuddin Khan Dagar. The program was organized by Sangeet Ashram and was held at G D Birla Sabhagar, Calcutta. Though weak from being released from the hospital a few days earlier, his immense dedication and love for his art let him forget all about himself as he immersed himself and his audience with touching recitals of raag Adbhut Kalyan, raag Behaag with some dhamar to conclude his program. He was ably accompanied on pakhwaj by Sri Mohanlal Sharma. Last evening was the third one of the Dhrupad Festival being held at Ramakrishna Mission, Golpark. The first performance was a solo pakhwaj presentation by Ravishankar Upadhyay. He first rendered a self-composed piece based on how Hanumanji created havoc in Lanka, which he followed by several other short laykari-s. 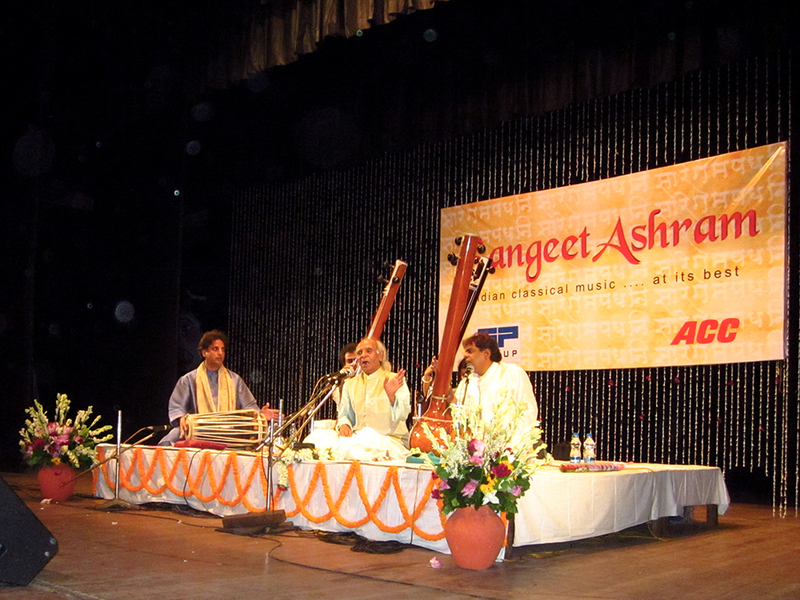 He was accompanied on sarengi by Asif Ali Khan and on tanpura by Debal Mukherjee. The next artiste was the dhrupad vocalist, Nirmalya Dey. He started with the rendition of raag Purvi in mandlay alaap, madhyalay alaap and drut alaap. Next was a sadra in jhaptaal, followed by a bandish in raag Desh and an araana. 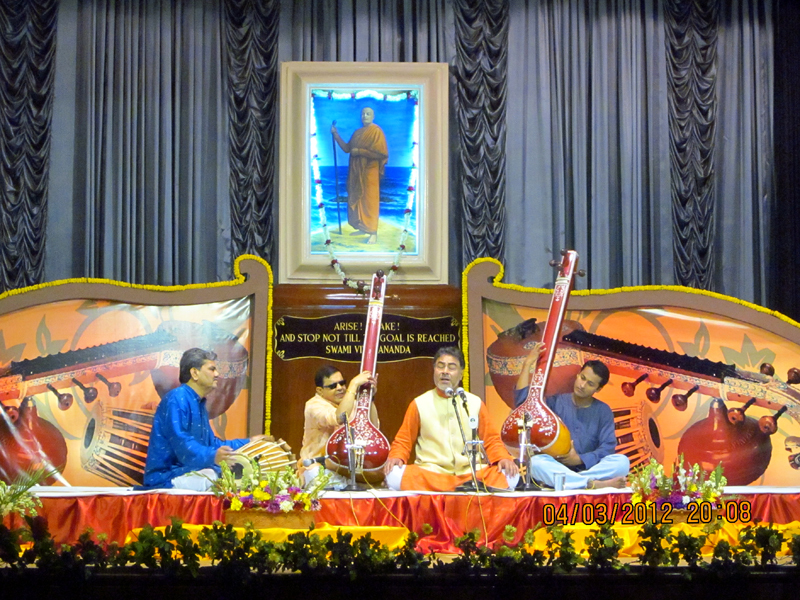 Manik Mude‘s pakhwaj, Asif Ali Khan‘s sarengi and Debal Mukherjee‘s tanpura were flawless in their supports. The last presentation of the evening was a raag Kaafi played by Pushparaj Koshthi on surbahar. He was skilfully supported by Mohanshyam Sharma on pakhwaj. 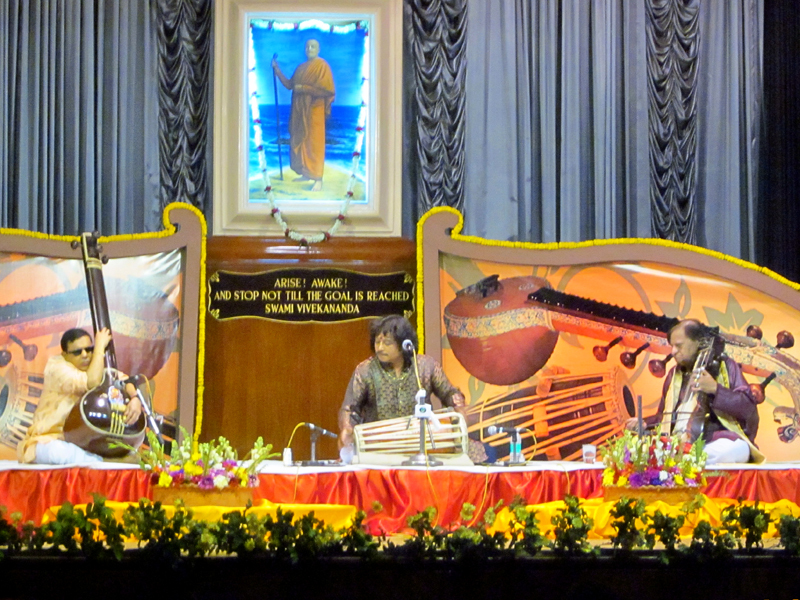 Door Darshan, along with Ramakrishna Mission Institute of Culture, has organized a four-day Dhrupad Festival to be held from 2nd March to 5th March at the Vivekananda Auditorium inside the Institute’s Golpark premises. Please visit our “Programs” page for the full schedule of this festival. Admission is free. On the first evening, the first performance was by Sukhdev Chaturvedi. He started with the rendition of raag Vasant, moving on next to Sahana and ending his repertoire with a short piece of Khamaj. The pakhwaj accompaniment by Mohanshyam Sharma was quite impressive and the sarengi of Asif Ali Khan with the tanpura of Debal Mukherjee was perfect in blending in. The second performance was a solo pakhwaj recital by Ramashish Pathak. He was accompanied on pakhwaj by Anil Chaudhary, on sarengi by Asif Ali Khan and on tanpura by Debal Mukherjee. 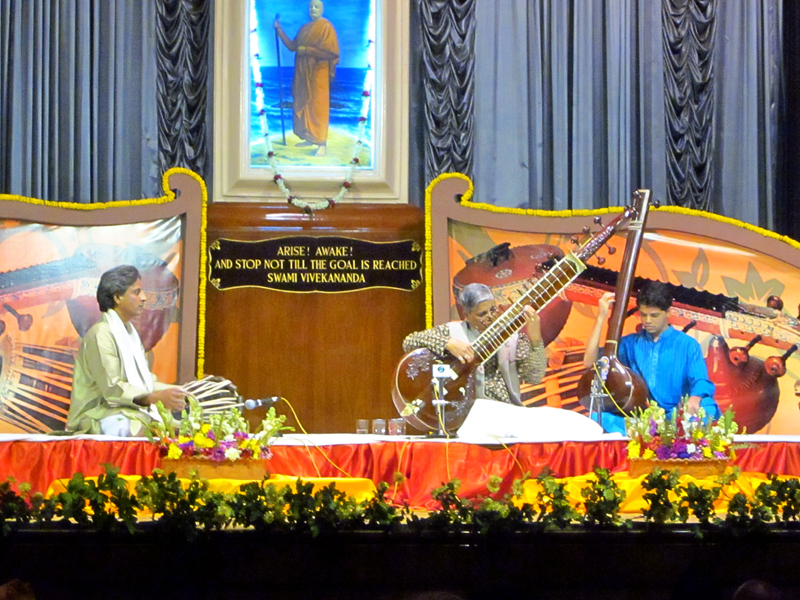 The last performer was Kartik Kumar with his surbahar with Manik Munde on pakhwaj. He started with the recital of raag Hemant and ended the evening with a Kaafi. This presentation was disturbed from the beginning by an audio glitch (microphone feedback) which prevented the listeners from enjoying it fully.